Discover the rich, alluring paint colors that reflect the rustic elegance of Mexico's old-world country estates with our exclusive Hacienda Style Color Palette from Pittsburgh® Paints. 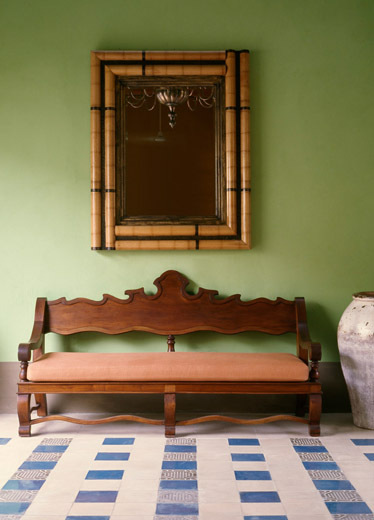 Our decades of hacienda explorations and design work have exposed us to the rich, traditional Mexican colors found in the country's centuries-old haciendas and colonial homes. Spurred by our passion for uncovering the vibrant palette of Mexico's colonial homes, coupled with the rising interest from homeowners in obtaining authentic paint colors from this area, we worked together with Pittsburgh® Paints color lab to research and replicate these traditional hacienda colors, many of which are featured in our 8th book, Hacienda Style. To view paint colors, download the Hacienda Style Color Card (click on image in bottom right corner). All 18 colors are available in any of Pittsburgh Paints' paint lines, including the environmentally responsible Pure Performance®. The Hacienda Style Color Palette is available at Pittsburgh Paints dealers in the U.S., Canada and Baja California. To find the dealer nearest you and to order Hacienda Style idea cards, visit www.voiceofcolor.com.